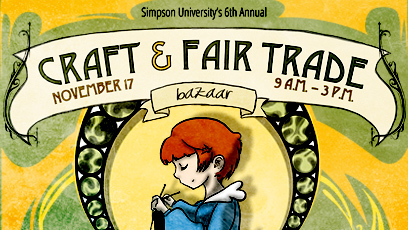 REDDING, Calif. - In time for the holiday shopping season, Simpson University announces its 6th annual Craft & Fair Trade Bazaar on Saturday, Nov. 17. The free community event, featuring more than 60 local artisans and five fair-trade partners, will be inside Simpson’s Heritage Student Life Center from 9 a.m. to 3 p.m.
Local crafters will feature photography, vintage jewelry, repurposed home décor, natural soaps, and other items. The craft fair will raise funds to support the student missions program and the Annual Student Scholarship Fund at Simpson University. For more information, contact Cathy at (530) 226-4750 or cgiacomelli@simpsonu.edu.